Friday arrived, the sun was hitting the window shades on the front windows insisting to enter so I complied, giving Kitty a chance to jump on her little carpet where the sun waited to warm her; after her breakfast and litter box cleanup, this is part of my morning routine, along with making fresh coffee, of course - as is opening the kitchen door that leads to the terrace where Ricardo installed a ledge, initially designed for watering the potted plants but was soon taken over as another sunbathing spot for Kitty. I enjoy and look forward to our established morning routine and so does my ever present companion, Kitty, who follows me around, commenting and insuring it's all done right. If you have a cat then you know exactly what I mean; I've tested this out by changing the steps or skipping something and she's right there letting me know what I've missed or changed, it's quite something really. Once done with this part of my morning I'm free to begin planning my day, errands to do and anything else that needs to be done before settling down to planning the daily menu. I find that today I can make do with what's at hand so I can begin my preparations slowly and have both lunch and dinner done early. 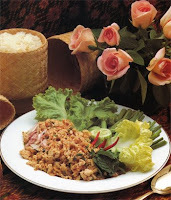 I got up with a taste for Thai Food so that will be my focus for the day's activities and since it's one of our favorite cuisines, will be enthusiastically received by all. Thailand is a land of incredible beauty and contrast, especially in their food which is all about contrasts: sweet, salty, hot and sour all delicately blended together to hit all the right flavor notes you need in order to stimulate those pleasure zones that leave you feeling satisfied. The trick is to not go overboard on any one of the contrasting ingredients but allow each to shine without dulling the others; a challenge yet a pleasure and a creative outlet as well. Combine all ingredients in a bowl and mix well. Taste to adjust seasonings and allow to cool in the fridge for at least 1/2 hour before serving. Note: This also makes a great filling for roasted Poblano Peppers who have been marinated in a vinaigrette and served cold on a bed of lettuce. I've included a lot of the optional ingredients I like to include but leave it up to each to custom make their perfect salad. Place bread on plate, fill with chicken salad, top with bacon, tomato and lettuce leaves and serve. Take the lemon grass stalk and cut into fine rounds and stop when the stalk gets hard and dry; place the pieces in a food processor and process until they are fine and flake like. Place all ingredients except the fresh basil in a food processor or blender. Process well. When cooked, always do a taste taste for salt and spice. Add more fish or soy sauce if not salty enough, or more chilies or chili sauce if not hot enough. If too spicy, add more coconut milk. If too salty, add a squeeze of lime juice. You can also add some sugar for contrast. Finish your curry by sprinkling the fresh basil over, or by gently folding it in at the last minute. Additional fresh coriander can also be sprinkled over. ENJOY! You can store your green curry paste in an airtight container in the refrigerator for use later. Paste will last 2 weeks (or longer), as the spices help to preserve it. It can also be frozen for up to 3 months. Thai Green Curry with Seafood.- Once you have the curry paste ready, adding ingredients is a snap. You can add fish, seafood, chicken pork, beef or keep it vegetarian. Cook the meats or fish first. I find I like charcoal grilling the best since it adds another level of flavor which really enhances th e curry, but you're free to do your own thing. One thing though, if using fish or seafood, just sear and don't overcook, then put in the curry sauce, allow to come to a boil and STOP! It will be perfect once it's served. If using fresh scallops and shrimp: put in a bowl, splash with some oil, salt, pepper and paprika and toss well. Get the grill or pan, hot. Put some oil in the pan and sear the scallops for about 1 min, turn and set aside. Add a little more oil to the pan and add the shrimp, cook until they're just starting to turn pink, take off the heat and reserve. If using a frozen seafood mix, put in a bowl and toss with some oil and salt and pepper. Heat the pan with some oil in it, add the seafood mix, salt and pepper and stir fry for about 5 min, then continue as explained below. Put some oil into the pan, on med-high heat add the curry paste, sugar and heat so it begins to loosen up, about 1-2 min. Add the lemon grass and stir. Reduce the heat to medium and add the coconut milk, green onions, bell pepper and bring to a boil; reduce heat to simmer and allow to come together for about 10 min. Add the lime juice. Taste to adjust seasonings and add more fish sauce, coconut milk or lime juice as needed. Finally, add the seafood and simmer for 5 more minutes and then turn off the heat. Allow to rest for 5-10 min so the curry can fully develop and get creamy. Enjoy! Combine the chopped fruit, strawberries, both sugars--white and brown, and water. Bring to a boil. Reduce the heat and let this simmer, until the fruit mixture starts to thicken, occasionally stirring, for about 10 - 15 minutes. Remove from heat and let cool. In a nonreactive pan, put the cream and heat, on low heat, until almost boiling. Don't let it boil. In a bowl stir all the eggs, sugar and blend well. Slowly stir the egg mixture into the cream, gently blending together. If you see egg pieces floating in the cream, then use a fine sieve to get these out. Add the vanilla and set aside. Once the fruit compote has cooled down, divide evenly among ramekins. You'll only need about 1-2 tbl per each. If the ramekins are small, then use 1 tbl only. Spoon the custard over the fruit and place the ramekins into a deep roasting pan. Fill the pan with hot water until it reaches about half way up the ramekins side. Heat the oven to 325 degrees and bake about 30-35 min. then remove the ramekins from the roasting pan and allow to cool. Cover the ramekins with plastic wrap and put in the fridge for at least 4 hours or overnight if possible. If you have a kitchen blow torch, use that, but most of us don't so sprinkle with the light brown sugar the tops of the ramekins. Turn the oven to it's broiler or highest setting. Place the ramekins on a cookie sheet and place as close to the heat source as possible, watching constantly, until it begin to get a golden color. Or you can also put the sugar into a teflon pan, on high heat. It will begin to melt, then turn golden, don't let it burn. As soon as it's golden, pour a paper thin film of the melted sugar onto the top of each ramekin. Place in the fridge for 15-30 min and serve immediately.